Deconstructing c o n f l i c tis an art exhibition, an inter-faith lecture and an opportunity to engage with the aims of One World Week by bringing together people of different faiths and backgrounds from across Essex to share concerns about the causes of conflict, hear others’ points of view and acknowledge shared values. 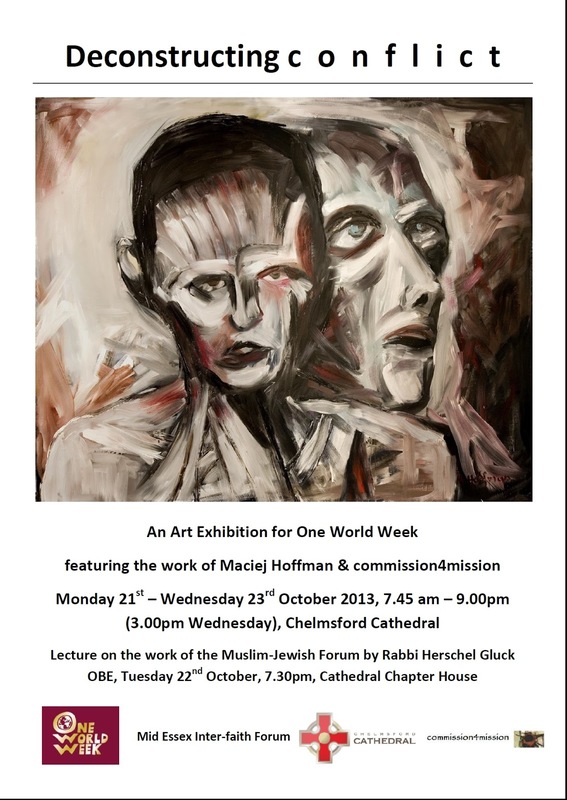 The art exhibition will be held in Chelmsford Cathedral on 21st – 23rdOctober 2013 (7.45am – 9.00pm, ends 3.00pm Wednesday) and will feature expansive expressionist paintings by Maciej Hoffman supplemented by related work from commission4mission artists. Maciej Hoffman is a Polish artist whose work is concerned with the trauma of all individuals and peoples who have suffered – and continue to suffer – worldwide. The keynote speaker for our inter-faith lecture is Rabbi Herschel Gluck OBE, founder of the Muslim-Jewish Forum which seeks to build bridges between Muslim and Jewish communities in the UK and around the world. 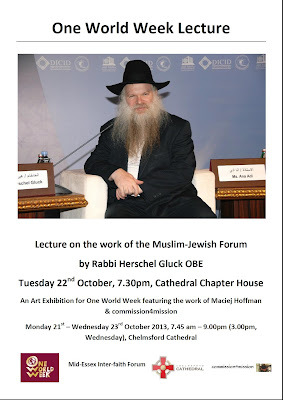 The lecture will be on Tuesday 22nd October, 7.30pm, in the Chapter House of Chelmsford Cathedral. A drinks reception will be held in the Cathedral from 6.00pm for those wishing to view the exhibition prior to the lecture. These events have been organised by Chelmsford Cathedral, commission4mission and the Mid Essex Inter-faith Forum to inspire, inform and encourage more people of diverse backgrounds to come together to explore shared values and take action to build a just, peaceful and sustainable world. Our aim is to challenge stereotypes which cause conflict and empower people to live and advocate peaceful lives. Maciej Hoffman says that he “views his art as both a means of self-expression and a way of engaging in public discourse, depicting contrasts, emotions and powerful human experiences.” His work has been the focus previously of conferences and events on themes of conflict and resolution in the UK and Poland, including Holocaust Memorial events. 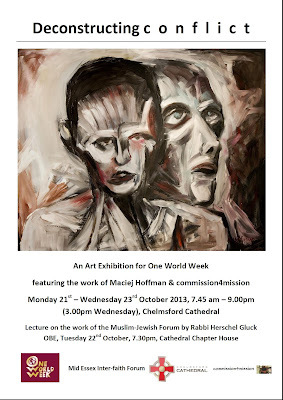 Our approach builds on the success of previous Mid Essex Inter-faith Forum One World Week events and the unique combination of art, presentations and debate which Maciej Hoffman has initiated in previous exhibitions such as: Art of Reconciliation 2012 – Edith Stein Centre, Wroclaw Poland; Blue Line Holocaust Memorial Exhibition 2012 – Town Hall, Barry; Journey Line 2011 – Town Hall Wroclaw; and Journey Line 2010 – Oxford Chabad Society.